Details Celadonite is a greenish mineral of hydrated iron, magnesium, potassium silicate containing small amounts of aluminum, calcium, sodium, and numerous trace elements. It is a bright green mineral that looks like tiny flakes of the mineral mica, or small lumps of clay. The color of celadonite varies considerably from pale green, bright green, bluish-green, olive-green, and black-green, depending upon its constituent elements. Our celadonite is a cool green earth from Ukraine. Celadonite was proposed in 1847 by Glocker as the name of a soft gray-green mineral that is a hydrous silicate of iron, magnesium, and potassium. The name, meaning "sea-green" in French, refers to the color of the mineral. The name was derived from the grey-green dress of the shepherd Céladon in the novel "L´Astrée" of H. D´Urfé (1568–1625). Similar material appears to have described earlier as "terra verti" by DeLish in 1783 and as "Grünerde" by Hofmann in 1788. Hendricks and Ross in 1941 showed that celadonite and glauconite have a very similar structure. The original celadonite came from amygdaloidal fillings, and Kerr and Hamilton suggested that it might be desirable to retain the name celadonite because of its different origin from that of glauconite. According to Anne Wall Thomas, unlike Egyptians who used copper frits, Indian monks in Ajanta used natural earths for green pigment. Green pigments usually detected in Roman wall paintings are green earths (celadonite, glauconite and chlorite). To characterize these pigments and to determine their origin, 76 samples dating from 1st to 3rd century C.E. and coming from 14 Roman sites in Switzerland and Pompeii were analyzed. Celadonite was the most frequent pigment found among these samples. Attribution of this celadonite was to Cyprus. Green earth pigments were used extensively by medieval artists, especially in the underpainting of flesh tones. Green earth, also widely known as terre verte, is primarily composed of the minerals glauconite and celadonite. Green earth is not classified in the strictest sense as an iron oxide pigment. The presence of celadonite or celadonite, minerals of complex silicate composition, produces colors that vary from cold bluish greens to warmer yellow and olive hues. It may have been formed originally from biotite (a dark-colored mica), but other minerals, and even organic matter, may change it into celadonite. The mineral has a micaceous structure, that is, a silicate crystallized in monoclinic forms that readily separates into very thin leaves. It is characteristically formed on submarine elevations of ancient seabeds ranging in depth from 30 to 1,000 meters (100 to 3,300 feet) below sea level, and in the sedimentary rocks of different geological systems. Usually it forms small (from 0.8 to 1.5 mm in diameter) green round or angular grains. The most famous deposit of green earth was found near Verona, Italy. Other mines produced variations in color and texture of the pigment: Baltic states, Bohemia, Cypress, France, Hungary, Poland, Saxony, Tyrol, and the Mendip hills of England. In Russia, deposits of celadonite are found in the Moscow area; Lopatinskoye, Saratov; and in Bashkirya, Bayguzinskoye. A number of sedimentary rocks containing celadonite are also located in Ryazansk, Leningrad, Kaluga, Ivanovo and Penzenskaya provinces. Our green earth from the Ukraine is among the finest in use today. Green earth pigments were often used by medieval artists for flesh undertones. This green underpainting neutralized the effect of the pinks and reds of the flesh colors. On the color wheel, the hue of green earth is the approximate complement to the pink used by medieval painters. Complementary colors neutralize each other, and this neutralization was important for medieval painters because of the materials they worked with. Paint pink and red tones of flesh directly onto white gesso would achieve a "sunburn" effect in the flesh of the figures. To neutralize the pink, painters painted a layer of green earth under the pink. The light would pierce the pink layer, then the green, and reach the white. White reflects all light colors, so the light is reflected back through the paint. Each color paint absorbed some colors, or wavelengths, of the light. Thus, as the light passed back through the paint to the viewer, the flesh tones appeared neutral. Celadonite is not found in nature as large accumulations, but rather in combination with clay or sand. Its content rarely exceeds 50% of the deposit, making it necessary to process the mineral for use as a pigment. 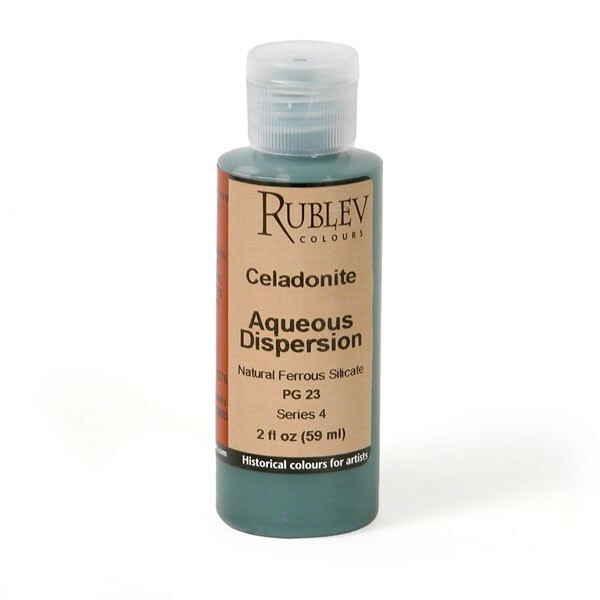 The preparation of celadonite is usually done with levigation, sifting and sometimes electromagnetic separation. Sometimes clay or sandy minerals, tinted with aniline red, copper pigments and chromium oxide, have been marketed under the guise of green earth. Ethyl alcohol can be used to detect the presence of aniline red, while mixing a sample with ammonium hydroxide can reveal the presence of copper-based colors.